International Test Conference- Santa Clara, CA – Business Wire – October 25th, 2007 — Intellitech Corporation, www.intellitech.com, the leader in lowering electronic product costs through IEEE 1149.1/JTAG, has announced the PT100 Pro test platform for testing PCBs with processors based on ARM® architectures. The PT100 Pro enables customers to reduce test costs and increase fault coverage by combining mixed-signal, concurrent 1149.1/JTAG and CPU emulation based functional tests in a single platform for testing up to thirty-two PCBs at a time. The tester is an ideal solution for PCB assemblies used in the cost sensitive Mobile, Home and Embedded markets. A number of customer specific versions of the tester are already in full production use in Southeast Asia. 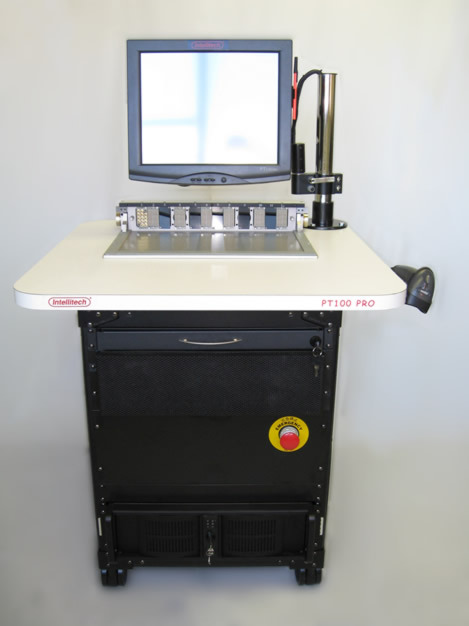 The PT100 Pro is based on Intellitech’s award winning PT100 and its patented CJTAG (Concurrent JTAG) technology which enables massive concurrent 1149.1/JTAG based test and emulation. The concurrent ARM based emulation test support enables the tester to go beyond boundary-scan stuck-at-faults to include at-speed cluster testing of all of the PCB components including non-1149.1 devices on a single tester platform. Power, mixed-signal and analog testing are achieved through the PT100 Pro’s built-in PXI instruments, power supplies and relays. “The ARM family accounts for approximately 75% of all the embedded 32-bit CPUs so it was a natural choice for us to target ARM for this tester’s CPU-based functional test support”, said CJ Clark, CEO of Intellitech Corp. “This tester fills the gap where in-circuit testers can’t perform at-speed functional test through the CPU emulation port and frequently are limited as to how many PCBs can be tested at once due to JTAG test pattern depth.” “It compares very well on the three “C”s customers care about, cost, coverage, and concurrency. The functional test adds higher fault coverage and the thirty-two PCB concurrent test provides better throughput when compared to an in-circuit tester coupled with a four port boundary-scan controller”, Clark concluded. The PT100 Pro supports up to thirty-two 1149.1 controller ports, up to 1870 analog/digital test pins with pneumatic or vacuum based fixture interface, PXI chassis and PXI measurement block, dual programmable power supplies, integrated dual-core Pentium based computer with raid drive, touch screen monitor, lockable keyboard, bar code scanner and Intellitech’s ScanExecutive Production Test Software. Prices range from $45K-$80K depending on configuration. ARM is a registered trademark of ARM Holdings plc. Intellitech and CJTAG are registered trademarks of Intellitech Corp.